Can this pleasant but innocuous rom-com really be generating Oscar buzz? Is there a category for Best Motion Picture to Pound Its Theme Into Your Skull With a Ball-Peen Hammer? 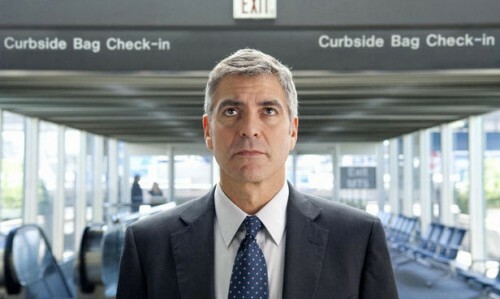 Directed by Jason Reitman, whose similarly ingratiating Juno was the beneficiary of a raging Oscar campaign by Fox Searchlight, Up in the Air stars George Clooney as a smoothly professional white-collar hatchet man whose company specializes in downsizing operations for troubled companies. Though he lives in Omaha, he's there for less than two months a year; the rest of the time he flies around the country, enjoying the good life of swank hotels and rental cars, and works his way down numbered lists telling people they've been canned. The movie opens with a montage of his unlucky targets reacting to the news, and they're heartbreaking. But for some reason we're expected to identify with Clooney, playing another of his dazzlingly suave cool cats. Life is good when you have no family, and every meal goes on the expense account, and when you walk into the hotel bar Vera Farmiga, playing another jaded frequent flyer, is eager to compare platinum credit cards with you and come up to your room and sashay around wearing nothing but your necktie knotted around her first-class hips. All others fly coach. Reitman knocked me out with Thank You for Smoking, whose hero was the same sort of corporate operator Clooney plays here. But with each subsequent film I'm beginning to realize that Reitman's best directorial move to date was getting behind Christopher Buckley's bracingly cynical source novel. Up in the Air isn't a bad movie by any means, and I was glad Reitman had the nerve to follow through with a brutally ironic ending. But the movie's neat little moral, that human connection matters, is so baldly developed throughout the movie that I wasn't surprised to see it spelled out on the poster.